Energy News: Uranium – Fuel for the 21st Century? Newly developed Daneros mine entries. The mine is in the White Canyon district about 60 miles west of Blanding, Utah. 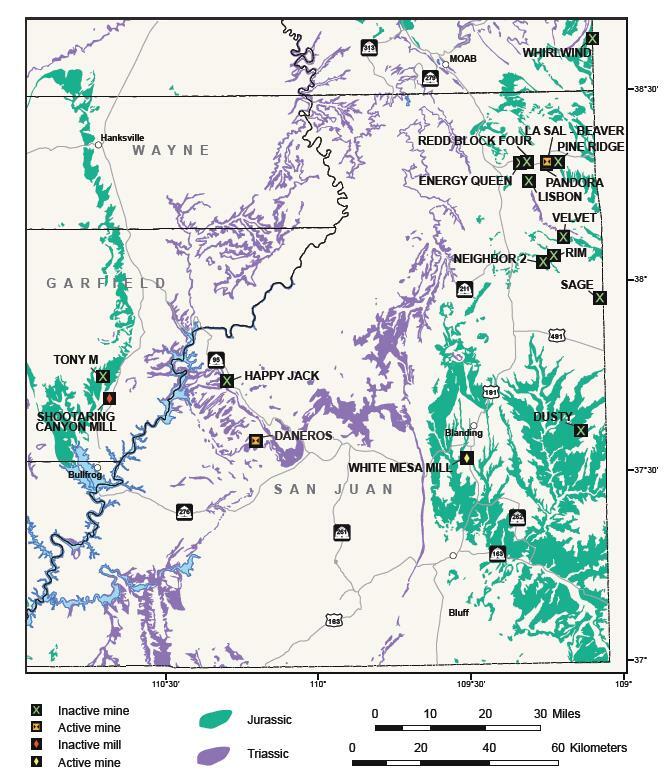 The White Canyon district ores are in the basal Shinarump Conglomerate Member of the Upper Triassic by Roger Bon Chinle Formation. World demand for uranium is increasing rapidly as the demand for electricity increases and more countries consider alternatives to carbon-based fuels. Over the past three decades, the U.S. has seen very little construction of new nuclear power plants, due in large part to public reaction following the incident at Three Mile Island in ı979. However, that may be changing as new energy legislation is being debated in Congress and incentives have recently been given to construct several nuclear facilities. 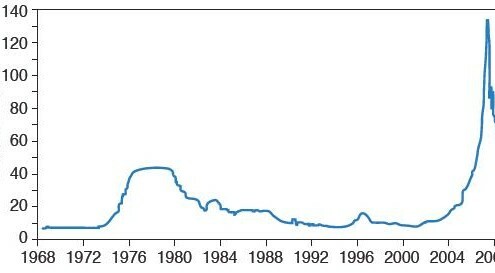 Prior to a surge in uranium prices beginning in 2004, all of Utah’s ı5 uranium mines were inactive or nearing permanent closure; most had been inactive since the early ı990s. The yearly average spot or short-term uranium price, which was about $8/lb in 200ı, rose to $88/lb in 2007. The weekly spot price peaked at $ı37/lb in late 2007 before entering a precipitous decline that appears to have stabilized with the current price near $40/lb. These dramatic price fluctuations have affected uranium production and mine developments in Utah. As prices surged in 2004 and 2005, numerous mines and properties changed hands, and several inactive mines were being rehabilitated in preparation for production. The two leading companies in this endeavor were Denison Mines Corporation of Canada and White Canyon Uranium Ltd., of Australia. 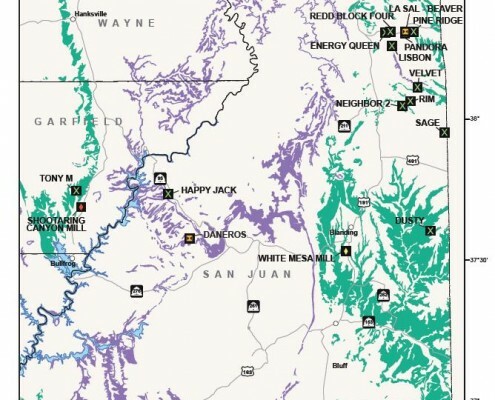 International Uranium Corporation (IUC), a Canadian-based company with a long history of mining and milling on the Colorado Plateau, owned five uranium mines and the WhiteMesa mill in Utah. IUC merged its operations with Denison Mines in 2005 to form Denison Mines Corporation. In September 2006, Denison’s Pandora mine was the first to go into production, and it is still operating. Denison next began rehabilitating its Rim mine late in 2007, and it was brought into production in early 2008. The Rim operated until early 2009, when it was idled. Denison’s third mine to go into production, the Beaver, was rehabilitated in late 2008, went into production in early 2009, and is still active. Denison’s fourth mine, the Tony M, hosts the largest remaining uranium reserve in Utah. When Denison acquired the Tony M mine in 2005, the mine had nearly ı7 miles of developed workings, most of which were flooded. Mine development began in early 2007, and in addition to rehabilitating the mine, most of the surface facilities were rebuilt. The Tony M produced from September 2007 to November 2008, when it was idled. Denison’s fifth mine, the Redd Block, remains inactive. Denison’s mines in Colorado have undergone a similar history: rehabilitation, limited or no production, and then idled. As of July 20ı0, Denison’s only operating mines on the Colorado Plateau were the Pandora and Beaver. However, Denison also has one operating uranium mine in northern Arizona that opened in late 2009, and produces a higher grade ore than the mines in Utah. White Canyon Uranium has done a remarkable job of development in a short period of time. White Canyon’s Daneros mine was permitted in May 2009, development began in July, and mining began in December. The Daneros is a relatively small, moderate-grade mine located near several historic uranium mines. The mine is ramping up production to about 50,000 tons per year. The ore is trucked to the White Mesa mill near Blanding, Utah, for processing under a toll milling agreement with Denison. The company is actively drilling properties near the Daneros for potential mine expansion. All of the ore produced from the Colorado Plateau and northern Arizona is trucked to Denison’s White Mesa mill for processing. 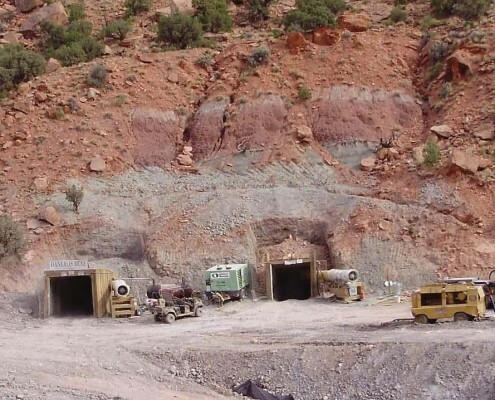 Although relatively easy to mine, the Colorado Plateau uranium ore is of a lower grade than uranium ore mined elsewhere—typically 0.ı5 to 0.35 percent U3O8and about ı percent V2O5 (vanadium pentoxide). The mill, which began operating in the early ı980s, recovers both uranium and vanadium from ore, as well as from an alternate feed waste material that also contains relatively high-grade uranium. The ı800ton-per-day mill can produce about 3 million lb of U3O8 , often referred to as yellowcake due to its color, and 4.5 million lb of V2O5, or black flake, annually. White Mesa began processing alternate feed material in 2005, and stockpiled ore from its own mines and other mines on the Colorado Plateau in 2008. The mill produced 6ı4,000 lb of U3O8and 50ı,000 lb of V2O5 from conventional ore and alternate feed material in 2009, and although spot uranium prices remain low, the mill will continue to operate because of long-term contract commitments at higher prices, relatively high vanadium prices, and low-cost alternate feed material. Uranium ore production in Utah went from ı200 tons from one mine in 2006 to ı38,000 tons from four mines in 2008, and then to ı03,000 tons from four mines in 2009. While there is a lull in mining activity in the U.S., world demand for uranium continues to grow as new nuclear power plants are being built overseas, most notably in China, India, and Russia. In 2009, 436 nuclear reactors operated in 30 countries that produced about ı5 percent of the world’s supply of electricity. In addition, 56 nuclear reactors are under construction in ı3 countries. Denison estimates that 570 nuclear reactors will be operating worldwide by 2020, which would represent an increase in nuclear generating capacity of more than 30 percent in just ı0 years. Based on this scenario, Ux Consulting Company LLC (UxC), one of the nuclear industry’s leading consulting companies, recently estimated that uranium demand will grow from ı85 million lb of U3O8 in 2009 to 247 million lb in 2020. The World Nuclear Association reports that about 76 percent of current world demand is met from mined uranium, while the remainder is provided by reprocessed nuclear fuel, blending down of highly enriched uranium, and stockpiled reserves. Could uranium become the “new” green fuel of the future? Is the current lull in mining in the U.S. the calm before the next boom? Will international suppliers step in to fill the demand? The answer to these questions will be answered in the next ı0 to 20 years as the unrelenting demand for more carbon-free energy continues. Only time will tell how Utah’s uranium industry will respond to these events. Additional information on uranium and nuclear power can be found on the following Web sites: Energy Information Administration (eia.doe.gov), International Atomic Energy Agency (iaea.org), U.S. Nuclear Regulatory Commission (nrc.gov), UxC (uxc.com), and World Nuclear Association (world-nuclear.org).